In 1851, Leon Foucault demonstrated the Earth's rotation to the world with a magnificent pendulum in the Paris Pantheon. 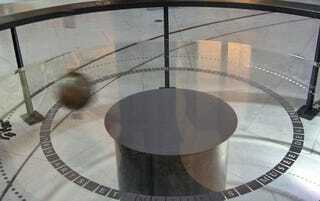 In 2010, that pendulum crashed to the Musée des Arts et Métiers' marble floor. The damage, as they say, is irreparable. Of course, a horribly dented brass bob—despite being busted up in three places—will still swing. The bigger damage may be to the reputation of the curators, who've swung down this road before: in 2009, a cocktail party attendee swung Foucault's Pendulum directly into a security barrier.